Surface Tension (1992) by Rafael Lozano-Hemmer is currently on display in Gund Gallery. An image of a giant human eye follows viewers when they walk by a plasma screen. The piece subverts traditional notions of observing art; instead of humans simply looking at the work, the art watches the viewers as well. Surface Tension implicitly guides viewers around the gallery, affecting their movement with its watchful eye. Rafael Lozano-Hemmer’s 1984×1984 (2015) is an interactive installation with a computerized tracking system. Thousands of numbers are displayed, each taken by Google Street View. As these numbers come from front doors across the world, they vary immensely in font and color. When viewers walk in front of the work, it depicts their silhouette, and all of the numbers count down to show the number 1984 throughout. Lozano-Hemmer’s piece is an homage to George Orwell’s novel 1984, and was made thirty years after the author anticipated the collapse of privacy. Aminah Robinson was an African-American artist born in Columbus, Ohio. She was taught at an early age how to draw, sew, and weave by her parents. Robinson knew that she wanted to become an artist when she was very young. She created works from various media, including paintings on cloth, rag paintings, and “hogmawg,” which is a mixture of clay, mud, leaves, glue, animal grease, lime, leaves, and twigs. Many of her works are about her family and community. She also depicted musicians, writers, civil rights leaders, and abolitionists in her art. The philosophy behind her works is based on the African idea of Sankofa, understanding the past in order to move forward. She is well-known for the RagGonNon, a work of art that is usually on cloth and embellished with found objects such as beads and buttons. Robinson attended what is now known as the Columbus College of Art and Design, and many of her works focus on Columbus, primarily its African-American community. She fused her formal art education with folk traditions that she learned from her family. Museums and galleries all over the country have displayed her art, and she received numerous awards from arts organizations. Microphones is currently on display in the Gund Gallery’s exhibition Rafael Lozano-Hemmer: Transition States. Microphones consists of one vintage 1939 Shure microphone in a separate room. As an interactive installation, viewers are encouraged to make sound into the microphone, and their voice will be recorded. Immediately after, half the time the installation will play the previous person’s voice back, while the other half replays a random recording from the past. The microphone can store up to 600,000 recordings. Although the viewer can control what they say, part of the experience is completely arbitrary. Katie is a senior art major, and art history minor from New York City. Katie has primarily focused on film photography throughout her artistic career, developing new and interesting ways to incorporate organic materials into this medium. Furthermore, Katie has been more recently working on larger scale installation pieces that are more sculpturally based. While she does not have anything larger in scale on display yet, she is excited to see how some of the projects she has in the works on will ultimately come together to create something bigger in the next few months. The use of organic materials has remained a common thread through the multitude of mediums that Katie has explored. Katie has found that Kenyon’s art program has offered her a myriad of benefits throughout her time as an art major. Katie states that the structure of the art major at Kenyon works to expand student perspectives on art, while simultaneously developing their skills through a wide variety of mediums. As such, Katie has found that she has been given the opportunity to establish a thoughtful and informed voice as an artist. Katie also spoke fondly of her time studying abroad in Glasgow, Scotland. Katie stated that her foremost influence is contemporary artist Tara Donovan, an American sculptor from New York City. Donovan uses everyday materials to create organic forms in her sculpture work. Katie would not consider her work to be specifically similar to Donovan’s, however, she draws her influences from a very similar place. The concentration on these ‘organic forms’ has been a primary focus for Katie in her own artwork. With the freedom to explore different mediums through her classes at Kenyon, as well as influence from artists like Tara Donovan, Katie has a begun to find her own unique artistic voice. Through her work, Katie has worked on exploring “edges” that exist and occur naturally in the world. For example, in her film work, Katie has crystallized salt from seawater onto film, thus integrating this exploration of natural edges with her use of organic materials. Katie continues to examine these concepts through the art she is working on today. The beginning of October has certainly been eventful for those of us on the Curatorial Practices team! We are currently writing wall labels for Rafael Lozano-Hemmer: Transition States, opening October 10. Lozano-Hemmer is best known for his interactive installations, which deal with a wide variety of issues such as surveillance culture and perception. Our goal is to write labels that will help inspire viewer participation and contemplation. We are actively trying to make these labels as concise and engaging as possible, framing our writing as a tool to guide the viewer’s eye through the visual and conceptual levels of the work. As of now, we have finished writing our labels and are moving forward into the editing stage. We hope to come out of this collaborative process with labels that form a cohesive and stimulating narrative. The Curatorial Practices team is also in early stages of developing an exhibition slated for this February, entitled Black Women / Black Lives. The show will broadly deal with representations of Black women in art and material culture from the Civil Rights Era to the present. We plan on connecting the works with various socio-political movements of the 20th and 21st century as a means of exploring the role of Black women in activism culture and in a larger, global context. Last weekend, the three associates that are leading the project—Jenna Wendler, Natasha Siyumbwa, and myself—traveled to New York to do research and collect works for the exhibition. Our main stop was Interference Archive, a repository of protest art and ephemera located in Brooklyn. For two days we sifted through their collection, researching relevant works that will potentially be included in Black Women / Black Lives. Additionally we visited the Lesbian Herstory Archives and the Brooklyn Museum of Art. We came out of the trip with a much better idea of the show’s conceptual direction and greater knowledge on the topic. Black Women / Black Lives and label writing for Transition States are our first big projects of the year. As once of the leaders of Curatorial Practices, seeing these projects evolve and move forward with the hard work of my team members has been incredibly satisfying. I am continually impressed with everyone’s dedication and intellect. Looking forward, I am very excited to work with everyone on the projects we have planed for the rest of the year. I have been going to museums for as long as I can remember. When I was a baby, my mother would wheel my stroller through the National Gallery in DC. DC’s free museums were a constant feature of elementary school field trips and middle school projects as well. Because it lives permanently in the Smithsonian’s American Art Museum, Nam June Paik’s Electronic Superhighway (1995) made an early impression on me. A great ode to the United States as seen through its television media, I could stand for hours watching each American state’s frenetic series of images flit by, encased in a neon shell. Last year, I finally bought a big Electronic Superhighway (1995) poster and put it in my dorm. 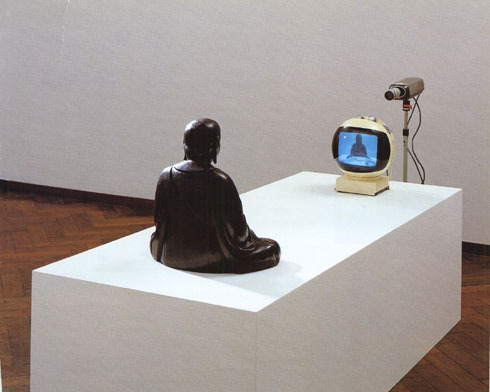 Nam June Paik was a Korean-American Artist who is most famous for founding the medium of video art. He was born in Seoul but his family had to flee during the Korean War. Landing in Japan for university, he made his way to West Germany after graduating. In Munich, he met experimental composer John Cage and his circle of friends and collaborators. In 1964, he followed Cage’s cohort to New York and became a central figure in the art movement known as Fluxus. Inspired by televisions, engineers, Buddhism, and the Fluxus movement’s focus on integrating everyday-experiences into art, Paik built a career on using televisions to create new artistic experiences. 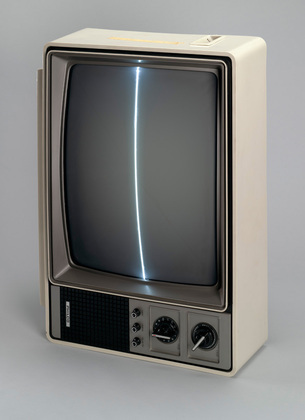 From simple constructions like TV Buddha (1974) and Zen for TV (1963), to large installations like TV Garden (1974), Paik transformed the average household television into a source of sophisticated emotional and intellectual expression. Whenever I see art made in any digital medium, I cannot help but think back to the first time I stood under his massive, glowing, Electronic Superhighway (1995). Emma Brown is a senior studio art major from Slippery Rock, Pennsylvania. What is Emma’s Artistic Medium of Choice? Emma has been focused on photography but she is interested in “a bit of everything.” This year, she hopes to focus more on mixed media and painting. What does Emma enjoy about having her own studio? Emma believes that it is important that she has her “own space to think in” and “spread out.” As a visual person, she especially enjoys being able to place everything she is “hoping to be inspired by” on the walls. What specific Kenyon art classes have inspired her? What contemporary artists inspire Emma?